A group of scientists from South Korea’s CHA University Stem Cell Institute has grown stem cells from adult cells using cloning techniques in a breakthrough experiment that could have significant medical uses. The research, published Thursday in the online edition of journal Cell Stem Cell, is only the second experiment to artificially create human embryonic stem cells, and the first to use adult human cells. The research team led jointly by CHA Stem Cell Institute in Seoul and Los Angeles, used skin cells from a 35-year-old man and a 75-year-old man to generate two separate lines of stem cells. The team transferred the nuclear DNA extracted from the cells and injected it into human eggs from four different donors. Using biomedical treatment and the application of an electric charge, which caused the cells divide and multiply, the scientists were able to create embryonic stem cells that contained the donors’ DNA, the research said. The process, known as somatic cell nuclear transfer, is the same technology that was used to produce Dolly, the world’s first cloned sheep, in 1996. 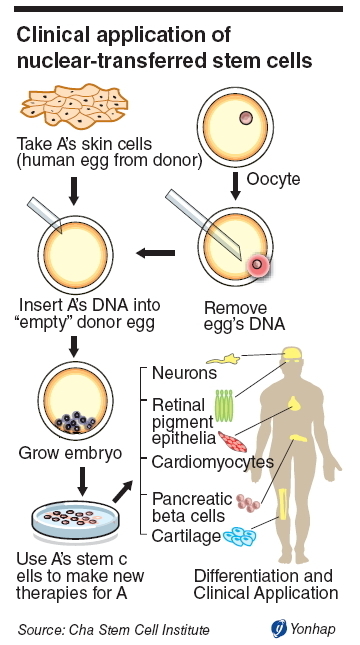 It is not the first time scientists have tried to create human embryonic stem cells from cloning. The first success in humans was reported last year by scientists at Oregon Health and Science University. But they used donor cells from infants. Researchers say using cells from younger donors is easier because infant cells have little environmental and age-related changes that could hinder the production of embryo-like stem cells that are genetically identical to the patient. Patient-specific stem cells would have to be created from older cells, not infant or fetal ones, they point out. In the new study, they used 77 eggs from four women and tested their new methods. Out of 39 attempts, the scientists managed to create two viable embryos. “Chromosome and DNA tests of the established stem cells prove that they are healthy embryonic stem cells originating from the somatic cells of the 75 and 35-year old donors,” Lee said. “This is a big step forward for the future of medical treatment,” Lee told The Korea Herald. The scientific community hailed the research as a major step toward creating stem cells that match a patient’s DNA, which would be used to treat diseases such as heart disease, diabetes and blindness. Meanwhile, some experts say that the study could reopen ethical questions over human cloning, as the study creates cells that are technically early stage embryos, and nuclear transfer is also the first step in reproductive cloning.